Delusions, a core symptom of schizophrenia, are defined as a belief that is firmly maintained despite being met with contradictory evidence. They can be very distressing and interfere with the social functioning of individuals. The cognitive mechanisms underlying the formation and maintenance of delusions is not well understood. This week in Brain, Baker and colleagues aimed to understand how individuals with severe delusions update beliefs based on new information using computational analyses of an inference-based decision-making task. Healthy controls and individuals with schizophrenia (half of whom were unmedicated) with varying severity of delusions completed a novel variant of a task commonly referred to as the ‘beads task’ to assess the relationship between delusion severity and evidence-based decision-making. During each trial of the novel ‘bead-task’, participants had to decide whether to draw beads from a hidden jar, at a small cost, or, if they felt confident enough, to guess the color most represented in that hidden jar, at a larger penalty in the case that their guess was wrong. The authors made great efforts to remove certain confounds from this test. Firstly, participants were given very detailed instructions, practice trials, a comprehension quiz, and post-task debriefing; participants who did not understand the task were excluded from analyses. To remove effects of general cognitive deficits and stress of time pressures, choice screens displayed the sequence of beads participants had drawn from the start of the trial to that point, and trial times were self-paced. To model their beads task data, the authors used a computational model (partially observable Markov decision process) in order to balance three components: (Bayesian) belief updating, value comparison, and choice. 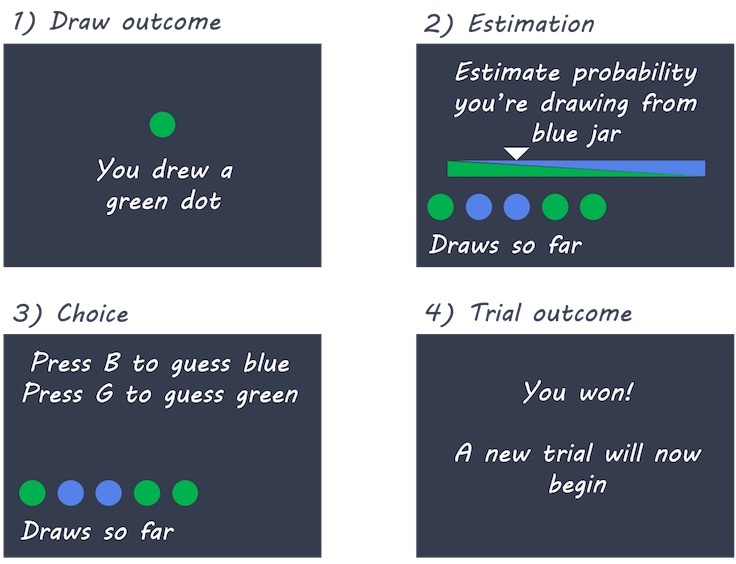 In short, the model estimates the expected value of guessing the beard color of the hidden jar (considering the cost of a potential incorrect guess), the expected cost of future guesses after drawing a bead (considering the cost of drawing a bead), and of potential incorrect guesses in the future. They tested whether individuals with higher delusion severity were more conservative or liberal with their guesses, and further investigated the effects of medication, other symptomatology, socio-economic status, and other aspects of working memory (based on two other tests). The authors found that individuals with schizophrenia that had higher delusion severity were more conservative in their ‘draws-to-decision’ (i.e. the number of beads drawn before making a guess on the colour of the beads). In line with previous findings, individuals with schizophrenia, with low-delusion severity were found to be more liberal than both controls and high-delusion patients. Further, they found that the relationship between delusion severity and draws-to-decision was unaffected when accounting for hallucination severity, medication status, working-memory, income, and socio-economic status. Based on their modelling, the authors propose that the increased draws-to-decision in delusional patients was associated with an inability to update beliefs based on new, incoming information. Patients who acquired a biased either at baseline or sequentially throughout the task had abnormal belief updating, as modelled by Bayesian methods, which altered their value-based decision-making abilities. This is fitting in light of the fact that delusions are, by definition, rigid beliefs (i.e. resistant to updating). This study found that a failure to update beliefs in the face of new evidence by relying too heavily on prior beliefs, underlies delusions in schizophrenia. Conversely, individuals with schizophrenia and low delusion severity may seek less information in their decision-making process. The specific association between delusion and impaired decision making may aid in our understanding of the mechanisms underlying delusions, and schizophrenia more broadly. Future work could investigate whether this relationship holds true in high-risk phases. Baker et al. A distinct inferential mechanisms for delusions in schizophrenia. Brain (2019). Access the original scientific publication here.